Good news for fans of Batman game series! The new information that Kevin Conroy, the actor who voiced the main character in Arkham Asylum and Arkham City, will remain in the Batman: Arkham Origins, has appeared in the network. This news was announced by Conroy himself, who said that he has already spent 10 months in the studio recording lines for the game, but Kevin did not specify, which role he would be playing. This news contradicts an earlier statement of Warner Bros. about the fact that they decided to refuse the services of actor Kevin Conroy and the main superhero will be voiced by another actor. We do not know whether the company has changed its decision in view of the fans indignation or Kevin Conroy will voice another character, but whatever it was, we can obtain the accurate information only after the official announcement from Warner Bros. Interactive Entertainment company. In addition, Amazon has published an interesting marketing twist about a bonus to those who will pre-order Batman: Arkham Origins. 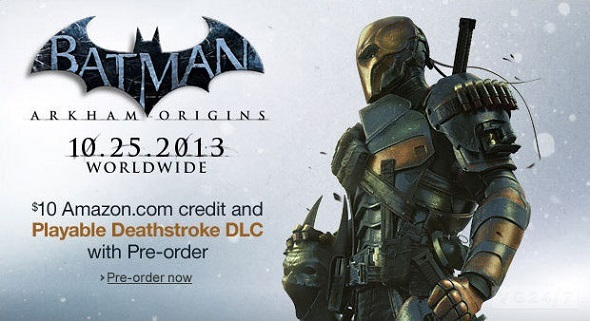 If the information published on the site is true, then the fans, who pre-order the game, will be able to play one of the recently announced villains - Deathstroke and it should be very interesting, because Deathstroke is one of the key antagonists in the game. How “exclusive” this DLC will be, we’ll get to know in the near future. In the meantime, we would like to remind you that Batman: Arkham Origins is scheduled for release on the Xbox 360, PlayStation 3, PC, and Wii U on the 25th of October 2013.